Ronalodo born on 22 September 1976 in Rio de Janeiro, Brazil. 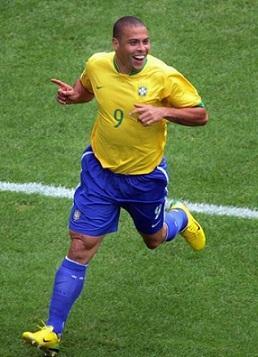 He is the top scorer in the history of World Cups with fifteen goals. Ronalodo is one of the few players who were on both sides of two great European rivalries, he defended the Spanish Barcelona and Real Madrid and the Milanese Internazionale and Milan. February 14, 2011 he announced his retirement from football. Ronaldo began his career in 1993 with Cruzeiro EC Brazil. After the World Cup in the USA was bought Ronaldo to PSV for 6 million U.S. dollars. PSV Ronaldo played 57 official matches and scored 54 times. He won the Asian Cup with PSV and was top scorer with PSV through a total of 30 times for the team to score. It earned him a transfer on to FC Barcelona for about 34 million guilders. He was there only one season games in which he scored 34 times in 37 games and with the Trofeo Pichichi as top scorer in the Primera Liga win. With Barcelona he won the European Cup II. In this final took Ronaldo from the spot, the only goal in the final against the French PSG on his behalf. A transfer record at age 20, Ronaldo was the best player in the world since. He was World Player of the Year in 1996 and 1997. From an early age Ronaldo was one of the biggest footballers ever counted. After successful years at PSV and Barcelona, he moved to Internazionale, where he was struggling with many competitors, such as the Chilean Ivan Zamorano and Italian Christian Vieri, but he made all expectations by making 25 goals in his first season. So he won the prize for best foreign striker debut on hold. Ronaldo was except for his goals but also known for his injuries. When, after a serious knee injury and rehabilitation for months made his comeback, he fell after only seven minutes by the same knee again. After another 20 months rehabilitation, Ronaldo made on 4 April 2002 for his comeback Nerazzuri when he was in the semifinals of the UEFA Cup as a substitute against Feyenoord starred twenty minutes. This Ronaldo was restored just in time for the World Cup in Japan and South Korea. Because of its great achievements during the 2002 World Cup, he received the title European and World Footballer of the Year. Real Madrid wanted at all costs the Phenomenon in the white shirt of Los Merengues get. His club president Florentino Perez of Real Madrid was the biggest and best club in the world by attracting only star players. Before the start of the 2002/2003 season departed Ronaldo, despite his history of FC Barcelona, Real Madrid. After earlier Luís Figo and Zinedine Zidane to Real Madrid came in 2002 followed Ronaldo. The team of the star players, was named Los Galacticos (the aliens) . Ronaldo gets assigned uniform number 11. Ronaldo makes his debut with Real Madrid on October 6, 2002. He comes onto the pitch in the 63rd minute and makes his first goal in the 64th minute. Less than fifteen minutes later hung his second against the nets. In his first three seasons at Real Madrid, running from 2002 to 2005, Ronaldo collects a whopping 68 goals in 97 official games. On January 30, 2007 announced that Ronaldo is in the 2006-2007 season between Real Madrid still exits. He left for Milan, where he was known by the medical staff and great hopes his career new impetus. For AC Milan officially came on Jan. 30 2007 year . Ronaldo made his debut on February 11 in a match against Livorno, which Milan won 2-1. In the next match with Siena scored his first goals for Milan . In this match also scored one assist, and Milan club won the game 4:3. By the end of the season yet appeared in 13 matches and scored 7 goals in them. He won theEuropean Super Cup and World Club Championship next season. In Milan he played 20 games in which he scored 9 goals. Ronaldo, playing for Corinthians with President Luiz Inácio Lula da Silva. On 4 March 2009 he, after recovering from an injury, his debut as a substitute for the cup match against Corinthians in Itumbiara EC. Since this debut for Corinthians, he has scored 22 goals in 14 games. Due to many injuries, he announced on February 12, 2011 to immediately end his career turn. Ronaldo said still like to be like. but it no longer can. The debut in the National Ronaldo goes back to 23 March 1994 against the Argentina and scored the first goal with the national team playing in the verdict the against Iceland. He was among the 22 squad for the World Cup USA 1994, but never got to the field. Since that edition of Brazil won the World Cup final against the Italy, Ronaldo was able to claim the title of world champion, just 17 years. He won the Confederations Cup of 1997 and two consecutive editions of the America's Cup ( 1997 and 1999 ). He led Brazil to the world champion title defense in the 1998 World Cup in France, reaching the final against the home team, but the night before the last act, Paris, Ronaldo was seized by convulsions, most likely the source epileptic. It was initially ruled in favor of Edmundo, but was reinstated just before the final, which did not play at its best. The French beat Brazil 3-0 and won the World Cup, and yellow on the ill Ronaldo who had caught the night before became a worldwide case. In the 2002 World Cup, which was played in South Korea and Japan , Ronaldo won the top scorer with 8 goals and was the star of the team which reached the final for the third consecutive time. This time the opponent was the title for Germany, which beat Brazil 2-0 with two of his goals. The victory earned him worldwide at the end of his second year, the Golden Ball ( 2002 ). Despite the elimination at the hands of France by 1-0 in the quarterfinals of the 2006 World Cup, Ronaldo has managed to become the best scorer of the final stages of the tournament, in three editions of the World has in fact scored 15 goals (4 in 1998, 8 in 2002 and 3 in 2006 ), one more than Gerd Muller, the previous record holder, and Miroslav Klose(14) and two more than Just Fontaine(13). A few days later announced his retirement from football played, the CBF has decided to organize a farewell match for Ronaldo in the national team, setting a friendly against Romania on June 7 2011 at Paceambu of St. Paul, home stadium of the Corinthians, the last team phenomenon. Ronaldo has played the last 15 minutes the first time, replacing Fred, author of the only goal of the match. In National Ronaldo has 62 goals in 98 total games, in the second scorer of all time Brazilian national record holder in 15 goals from Pele.